You are invited to a Sing-A-Long for Hamsayeh International at Carnlea Orange Hall, Loughmagarry Road, Ballymena. 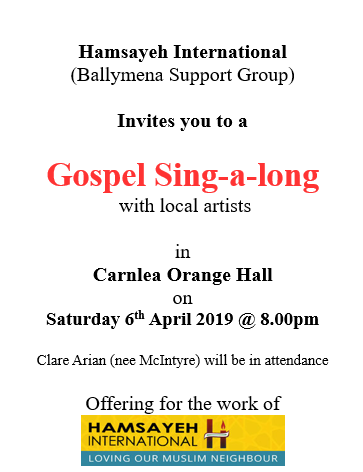 The Ballymena support group for Hamsayeh International are planning to hold yet another Sing-A-Long Night at Carnlea Orange Hall on Saturday, 6th April 2019. This has become an annual event and will get underway at 8pm. For anyone who is unfamiliar with the organisation, Hamsayeh means ‘neighbour’ in the Farsi langugage. It was set up by Clare Arian (nee McIntyre) and her husband, Am*r about eight years ago. They mainly reach out to Farsi speaking Muslims from Iran, Afghanistan and Tajikistan. During those eight years the work has grown substantially. Just in the last 6 months they have opened an outreach centre in West London called the Treasure House. Here folks come to learn English, use the library and take part in Bible studies. You can read much more about Hamsayeh International and their ministry to the Muslim community on their website here. During April’s Sing-A-Long, you will get the chance to hear from Broughshane native, Clare about the life-changing, soul-saving mission that she and her husband are involved in. Various local guest artistes promise to make the evening extra special for everyone.